On January 16, 2016, a meeting of the party’s district body was convened to hold a vote of no confidence against the District Amir of Nowshera, Mufti Sajjad. Provincial Secretary General of the JUI-F, Maulana Shujaul Mulk and Deputy President of KP, Maulana Attaul Haq presided over the meeting. As per media reports, Maulana Shujaul Mulk had stated that the no confidence move against Mufti Sajjad had died down, and that action would be taken against the activists for violating the party discipline. However, while speaking at a press conference after the meeting, former Provincial Secretary General of the JUI-F in KP and dissident party activist, Mufti Hakim Ali Haqqani claimed that the no confidence move had been successful and accused Maulana Shujaul Mulk of bypassing the decision of the majority members of the party’s District Executive Committee. A total of 220 votes out of the 295 members who were present expressed no confidence in the present district cabinet and a fresh election should be organised1. According to the JUI-F constitution, a 2/3rd majority should be present in the house in order for the motion to pass. Maulana Shujaul Mulk informed PILDAT that a 2/3rd majority was not present as Mufti Hakim Ali Haqqani and his supporters refused to enter the house2. Hence, the current cabinet remains in the office along with the District Amir, Mufti Sajjad. Carrying out the due procedure to settle matters of dispute and dissent is indicative of intra-party democracy in JUI-F. In the aftermath of winning the recent Local Government election, the PML-N district leadership of Sialkot has sought applications with non-refundable amounts as fee, from all those wanting to contest for the positions of Chairmen, Vice-chairmen and Mayors. For the seats of Chairmen of District Councils and Mayors of Municipal Corporations, the candidates are required to pay Rs. 200,000 as fee in order to apply for the party ticket. Candidates for the slots of Vice-chairmen District Council, Deputy Mayor Municipal Corporation and Chairmen Town Committees, are required to pay a fee of Rs. 100,000. Candidates for the seats of Vice-chairmen of the Town Committees would be required to pay Rs. 50,000. For the special seats of District Council and Municipal Corporation, candidates would pay Rs. 15,000. For the special seats of Town Committees, a fee of Rs. 5,000 will be required. 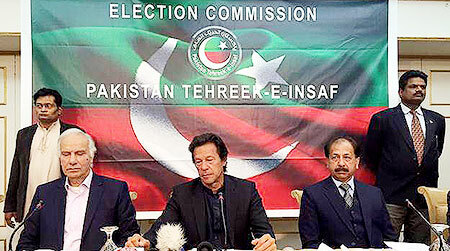 While addressing a press conference held on January 15, 2016, Pakistan Tehreek-e-Insaf (PTI) Chairman Imran Khan stated that the party’s intra-party elections would be completed before April 25, 2016. The 20th anniversary of the party is due to be celebrated on April 25, 2016 by which time it was hoped that the election process would be concluded. Mr. Imran Khan reiterated that an interim set-up was working in order to hold the intra-party elections, and that everything was being done in accordance with the decision of the PTI election tribunal headed by Justice (r) Wajihuddin.5 The membership campaign is currently on-going that would continue for two months (which means till March) and it is being made sure that irregularities from the last party elections are not repeated. In order to strictly maintain the neutrality and independence of the intra-party election process, it would have been better to leave all such election-related announcements to the party election commission while the party chairman who himself may be a candidate in the forthcoming election, should take a proverbial back seat. 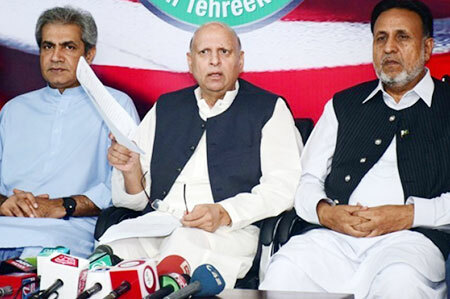 Chaudhry Muhammad Sarwar had joined PTI on February 10, 2015 soon after he resigned as the Governor of the Punjab. He was appointed as PTI organiser in Punjab only 3 months later7. According to Section 5 of the Political Parties Order of 2002, a person cannot be appointed or serve as an office-bearer of a political party if he is not qualified to be, or is disqualified from being, elected or chosen as a member of the Parliament under Article 63 of the Constitution of Pakistan. Article 63 (k) states that a person shall be disqualified from being elected or chosen as, and from being, a member of the Parliament, if he has been in the service of Pakistan or of any statutory body or any body which is owned or controlled by the government or in which the government has a controlling share or interest, unless a period of two years has elapsed since he ceased to be in such service. Mr. Sarwar had resigned from the position of Governor Punjab on January 29, 2015 and the two years period would complete on January 29, 2017. Addressing a party workers’ convention on January 17, 2016, the MQM chief Mr. Altaf Hussain announced the restructured set-up of the party. The ‘Unit and Sector system’ in Karachi was abolished and a new organizational set-up was introduced. The ‘Unit’ of the MQM’s organisational structure would be called as ‘Union Committee’ and ‘Unit in-charge’ would be called as ‘UC organiser’. Similarly, ‘Sector’ would be called as ‘Town’ and ‘Sector in-charge’ would be called as ‘Town organisers’. It was reported in the media that objections to terms ‘Unit’ and ‘Sector’ were made as the terms were also used by the Pakistan Army. However, the change is also aimed at harmonising the basic party structure with the city’s local government set-up in order to bring improvement to the overall working of the party8. According to Article 10 of MQM’s constitution, “No rules and Regulations or any part of this constitution shall be rescinded or amended except by a 2/3 vote of the Committee.” As the change in the organisational set-up requires a constitutional amendment, Mr. Rehan Hashmi of MQM informed PILDAT that the prescribed process was followed before making this decision9. A meeting of the Rabita Committee was held on the day of announcement in Karachi and a 2/3 majority favoured this amendment. The amendment is limited only to Karachi’s set-up and for a period of 2 years, which means, that by the next General Election of 2018, the organisational set-up may be reverted. The ANP has constituted a seven-member committee on matters related to the China-Pakistan Economic Corridor (CPEC)10. The seven-member group will focus on the CPEC, especially its western route and will make all party decisions on the developments and activities related to it.